California's only solar company OWNED by its customers. Businesses across California are taking advantage of the financial benefits of installing solar energy systems. Most companies that own their building can benefit from generating their own electricity. Investing in stable solar energy can easily return a 15% profit and pay for itself in as little as 5 years - what other cost-saving or investment programs can offer that? Worried about cash flow? The combination of significant federal tax credits, California state rebates, and accelerated depreciation can result in positive cash flow in year one! According to the latest Nielsen Global Online Survey, consumers prefer to do business with companies they believe to be friendly to the environment. The survey found that 80 percent of consumers are “concerned about the global environment,” while over 50 percent claim to have changed their behavior on a daily basis in the past six months to address climate change. By producing clean, renewable energy with the help of a solar electric or solar hot water system, you will demonstrate a commitment to the environment. What a great news update to send to your customers – you are managing your expenses to provide them with low-cost products and services while reducing your environmental impact. The triple bottom line! Is your business a good candidate? Find out with a Free Consultation. 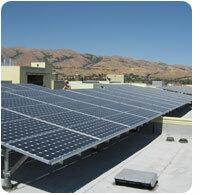 Cooperative Community Energy is California’s only solar co-op. Our unique business model puts the needs of our customers at the center of everything we do. Fill out the short form at the left for your FREE, unbiased savings analysis NOW! Copyright © Cooperative Community Energy. All rights reserved.